This is my second book of Sudha Murthy, first one being 'Wise and otherwise', which is a collection of realistic short stories. Read the review here. Sudha Murthy's writing style is simple and very easy to follow. Her stories may not have big twists or interesting turning points, but still they keep you glued to the book till the end. While we read, we will be transferred to the place mentioned in the book and feel like we are present in that scene as a witness and able to understand the feelings of characters in the story. Story is about an ideal working woman 'Vinuta' who marries a clerk Girish and starts living in a middle class family in Bangalore. She works as a school teacher and is very satisfied with her life. She becomes an ideal daughter in law and takes up family responsibilities easily. But her mother in law Gouramma and siter in law Surabhi are very greedy and always give importance to the elder son of the family Chandru and his wife Jamuna who is from a rich family. They always sing praises of Jamuna and Chandru who stay in US with green card and send money to the family whenever required. They never understand the importance of Vinuta and always humuliate her by comparing with Jamuna. Gauramma dreams of visiting US and stays for an year with Jamuna to take care of her grand child. 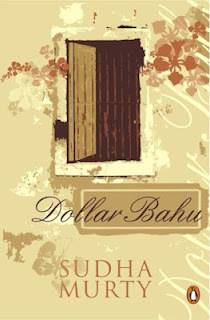 Her perspective on life and money changes after observing many people's lives in US. She realizes the importance of love over dollars, hates herself for loving the dollar bahu Jamuna and ignoring her good daughter in law Vinuta. About US: Though these lines are applicable only many years ago. Now, standards of living improved here too. this is a funny country. Like a colourful web spun by a spider, an insect walks in and gets trapped. At first we are drawn by the best technology and handsome renumeration. But once we stay here for sometime, it is difficult to go back. We get used to the easy living conditions and the professional work atmosphere. The conditions in our country are far below what we expect. Sometimes I feel there are many good reasons to leave India, and it is much more difficult to go back and settle there after so many years. She realized that the grass was always greener on the other side. America was no longer a fantasy land for her. There was pain, misery and happiness there, as in any other country. It was no longer the land of mighty dollar, which made magic. So, do read the book if possible and share your opinion.